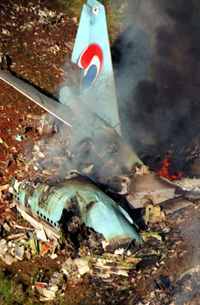 At 1:42am on 6th August 1997, Korean Air flight 801 crashed into Nimitz Hill, 5km short of Guam airport, skidded for 600 metres, destroying an oil pipeline before falling into a ravine and bursting into flames killing 228 of the 254 people on board[i]. Your company could be heading in exactly the same way, for exactly the same reason. In his book Outliers, Malcolm Gladwell talks to some of the experts who have studied this crash and its causes. There were a series of faults and errors leading up to the crash, making it more likely that it could happen, but none of them actually causing it. What it ultimately came down to was the inability of the cockpit crew to challenge the pilot (who was exhausted and clearly not thinking straight), and of the co-pilot to explain their situation to air traffic control. The crew’s inability to act was not due to poor ability, but the etiquette of the Korean culture. How can it be that someone could hold onto such etiquette in the face of imminent death? Low PDI countries include Australia and the United States, high PDI countries include Mexico, and yes, you guessed it, South Korea. The Korean language reflects this with six different levels of conversational address depending upon the relationship between the addresser and the addressee. At the dinner table the low-ranking person must wait for the higher-ranking person to sit down and start eating, cannot smoke in the presence of a social superior, turns away and hides his glass when drinking, etc, etc. This was also reflected in Korean Air’s flight crews’ relationships. It had been the case that junior officers would have been expected to cook for the pilot during layovers. That “the captain is in charge and does what he wants, when he likes, how he likes, and everyone else sits quietly and does nothing”. In one Delta report an auditor in the cockpit witnessed the first officer make a mistake, when the captain picked it up he hit him with the back of his hand for making the error. All of this subservience leads to “mitigated speech” where meaning is downplayed or sugar-coated. So when the crew realise there is a problem they drop hints, or ask questions, rather than giving a command. An exhausted pilot failed to pick up the hints, and flew straight into that hill having run out of fuel. Authoritarian management is as dangerous as a sloppy engineer in the airline industry, so what impact on innovation and new product development does an atmosphere of blame, punishment, and rank have? It is pretty obvious that if you are constantly blamed for doing the wrong thing, we quickly revert to a policy of “do what you’re told, only what you’re told and keep your head down”. Innovation is vital to any company, in any industry. It is necessary to reduce costs, improve performance, and to develop new products, which will ultimately be the source of future revenue and profits. However dominant, however smart, however rich, your company is going to crash and burn sooner or later without innovation. Innovation involves risk and uncertainty. The risk is hugely heightened in an authoritarian atmosphere, because until the innovation is completely designed and every eventuality taken care of, there is no certainty that it is a positive innovation. When discussing innovations we have to talk in questions, hints, preferences, we do not have the certainty required to issue a command. In return senior managers have to be open-minded enough (and awake enough) to notice that mitigated speech, and engage in the conversation. Even if there are other critical priorities, they have to take the risk upon their own shoulders and accept that this innovation could make a difference. And, no, hitting the offending junior with the back of your hand would not be the optimal response. [i] Malcolm Gladwell, “Outliers”, Chapter 7. This entry was posted in imagine and tagged coaching, commercial, creativity, innovation, management, psychology. Bookmark the permalink.